Don’t know what to do this month? I’ve got you covered! Check out these awesome events in Leiden and the area which are sure to make your month better. A charming market that takes place four times a year in pop-up locations. This weekend you can enjoy walking around the stalls, which sell designer and hand-made products. Admission is 2 euros. For all you Marvel fans, Trianon is organizing a special double screening of Avengers: Infinity War and Avengers: Endgame. Since the premiere of Endgame is on the 24th, the screening of Infinity War starts at 9, and Endgame will follow after midnight (thus, officially, on the 24th). Make sure to reserve tickets, as they sell out real fast! You know how all you wanted was to relax on the beach with some beer and friends, a bonfire and nice music in the background? Well, the annual Scheveningen Bonfire Beach Fest’s got you covered! Although not technically in Leiden, it’s still a train and a tram ride away, so don’t let it intimidate you. So gather your friends and come enjoy the beginning of summer. If you’re looking for some more action, you could always take the train to The Hague, where there are bigger stages and more people. It is tradition to have flea markets on Kingsday, and Leiden is no different. The biggest one stretches along Lange Mare, and you can find some very cheap and nice things there- from clothes to books, to home-made food. If you want you can also grab a blanket and sell some things yourself! Jus D’Orange– if you’re not too hungover, and you want some more music and partying., make sure to buy a ticket to the festival in Leiden! In a closed area next to the windmill (Molenwerf) you can party from 13:00 till 23:00. If you’re capable of that, of course. Tickets are 19.50. 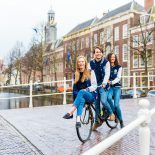 This entry was posted on April 9, 2019 by Maya Orbach in Festivals, Leiden, Living in Holland, Maya, Student City, Student Life, Uncategorized.